Ron Zacapa Solera 23 yo - Not a big fan of rum, had to try it apparently recommended as a great pairing with cigars. Paired it with Hoyo de Monterrey Petit Robusto. Didnt quite like it at first but grew on me as the cigar progressed. Bruichladdich 12 yo - Good but not great, wasnt memorable to be honest. Had the 10 yo expression, to my recollection was better. I've been on a mission to try Japanese whisky. Since I tried the Yamazaki 18 year old a couple years back, gosh i fell in love with Japanese whisky after that. Such finesse, smooth and refined, how the hell does the Japs do it. Whatever they do, they take it to the next level. Tried this over the weekend Nikka Taketsuru Pure Malt 17 year old. I've read reviews on it before drinking it, there was 2 extremes of it, it either scored poorly or high. My guess is it might be different bottling. My tasting was smooth that goes without saying very typical of Japanese whisky, Hints of vanilla, slightly sweet on the tongue. The finish wasnt particularly memorable neither was it on the nose. Overall still very very good whisky. Try the Suntory Hibiki Japanese whiskey. 17 years. It will blow you away. Sounds like an expensive hobby. I've only ever been to a whisky bar once. The Irish owner claimed to have 3000 types of whisky (if I remember right). It was really cool. There were like 6 of us, and the owner sat down with us and entertained us the whole night. He recommended we try this and that. I had some of his beef stew that his wife made. It takes time to develop your own preference, especially when it comes to whiskey. I'm more of a single malt person, much thanks to my own family upbringing (my dad is mad about single malt). I suggested the Suntory Hibiki 17 years single malt because it will be the most unexpected pleasure you'll ever experience (that is if you like whiskey lah) and no one expected the land of the rising sun, well-known for its sake, to produce a world class (and rightfully recognized) single malt whiskey like that. Hibiki is blended whisky btw not single. Its not bad a bit rough but not in the same league as Yamazaki. Yamazaki is the gold standard for japanese single malt. Its 18 yo has won numerous awards. If you want single malt a bit out of the ordinary i recommend Nikka Yoichi 12 sublime or for something a bit different Hakushu 12. Hakushu the cask is aged in bamboo forest. How it helps with the taste i've got no freaking idea. Kotmj, i like whisky and wine, i do tend to gravitate towards whisky for the ROI, at the end of the day the reason i drink is to get slosh. Whisky being an expensive hobby is really subjective, i do believe there's lot of brilliant whisky at the 12 yo expression, without bursting your budget. After a long week, i find a a couple of glass of whisky just helps me to unwind. My ultimate favorite for Islay would have to be Laphroaig Quarter Cask. I must admit have not tried Bowmore recently, i did visit distillery when i was younger. At the time didnt have the appreciation for that peaty taste. I used to drink a lot more than I do now. Mostly wine, such a great drink. But I cannot think and plan when I've had alchohol, and nowadays I need to do a lot of thinking, even after work, all the way till bedtime. I also realised sometime back that alchohol causes me to lose some memory and a general dulling of mental acuity, which I cannot afford at this stage in my life. Now that I've written this, I realise what a great source of pleasure I've been denying myself. I'll drink something tonight! I tend to agree with you, needles and alcohol dont mix. But seriously dude, what is life without these little pleasures. My dad likes the Laphroaig Quarter Cask too along with the Yamazaki, but I'm not a fan of either one. Besides Bowmore, I like the Auchentoshan 12y and 3wood too. Macallans, though, seem to be a real crowd pleaser (except for the Select Oak). They cater to a wide variety of tastedbuds and are great for large groups. I can smell a scotch club in the making. I just bought this at a Carrefour near me. I know, I know ... the worst 12 year single malt one can buy etc. not far from Chinese tea, etc. but I haven't had whisky in ages and my family and relatives are having dinner in a nice restaurant tomorrow and I thought I'd bring this along. Here's to masasacring a few clumps of old brain cells tonight! Any love for shochu or soju? 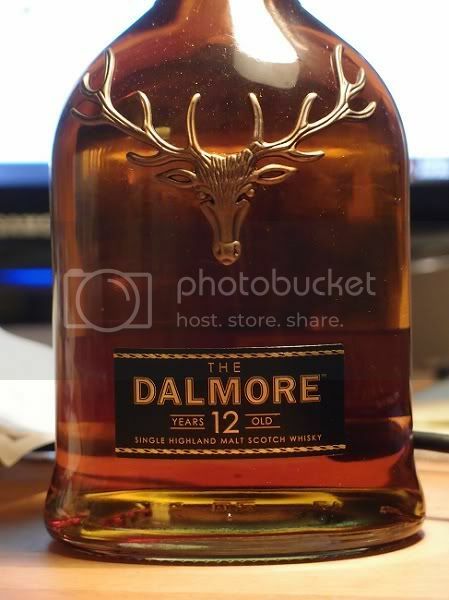 My friends and I opened a bottle of Dalmore in a pub, and hated it. Thought it tasted like bread. Surprisingly though, after 3 months (we left it at the pub), one of my friends who was there on the first tasting said that it had somehow become nicer. He finished it that night. I was too chicken to try it again, so I stuck with the Macallan. 6: My man!!!! My exact same thoughts. Some cigar ppl say though, islay whisky will overpower the cigar. I say stuff it, if you like it do it. Kotmj: You might have hit a jackpot on the Dalmore 12, just read the reviews by Jim Murray (renown whisky writer) its rated 90. If you want his tasting notes let me know. Dynamite: Macallan dont do it for me anymore, terribly boring whisky unless its the older expression. No character, no complexity. But your right everybody seems to like it. I've tried a glass of Auchentosan, wasnt particularly memorable. Caol Ila is quite nice. Zinzan, nobody at the dinner liked the Dalmore! Hahahaha. I'm not surprise taste is such a subjective thing. I bought his book just for a point of reference. Initially i didnt agree with some of his ratings i.e. Glenrothes and Balvenie Doublewood which he gave low marks which i thought was excellent. As my palate developed i began to taste subtle nuances that he described and then i started to understand his ratings. Supposedly all this wine and whisky critic have super palate, they taste more than us normal human beings do or maybe they're just better at describing it. Nowadays i find his ratings are quite spot on to what i like. For a good reference website refer to Malt Maniacs, they have quite an extensive list. Great resource for sourcing the next bottle to taste. Thanks for sharing. Cheap wine. The Thai Song equivalent for those of us with white collar jobs and pretensions. 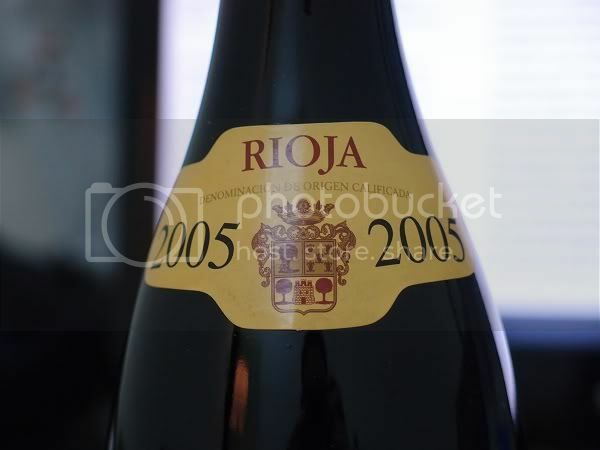 Had a sip (maybe a gulp) during lunch -- this Rioja is lovely. RM75 at M&S KLCC. Finished remainder of my Nikka Takesuru last night. I actually posted before but it didnt come out. Nonjatta is great resource for Japanese whiskey. It even has the history how Japanese whisky industry started. A great story of a Jap who was in Scotland in the late 18th century working distillery. on whisky, anyone tried auchentoshan before? Just tried the Auchentoshan 12 is not bad, light peat and nice smooth finish.